Business matchmaking event for Nordic SME’s with smart city solutions in ICT, cleantech, medtech, fintech, mobility, and more. Meet up and match with multinationals, clusters, industry networks and other market insiders from the Nordics on November 22nd. What are the keys to successful smart city exports in market X? What are the dos and don’ts? How can SME’s support big corporations in strengthening their offers? 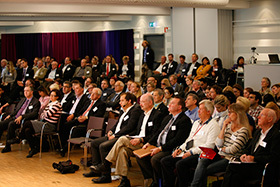 How can Nordic suppliers partner up to make it happen? The SME2GO Smart City Meetup will through sharp matchmaking sessions and present business leads, use cases and real-life experiences from field experts, industry networks, and multinational corporations looking for new business partners. Aktiviteten arrangeras av Swedish Incubators & Science Parks, Västerås Science Park, Tehnopol, Turku Science Park, Posintra.